The study, now in its 18th year, measures overall guest satisfaction across eight hotel segments: luxury; upper upscale; upscale; midscale full service; midscale; economy/budget; upper extended stay; and extended stay. Seven key factors are examined in each segment to determine overall satisfaction: reservation; check-in/check-out; guest room; food and beverage; hotel services; hotel facilities; and cost and fees. 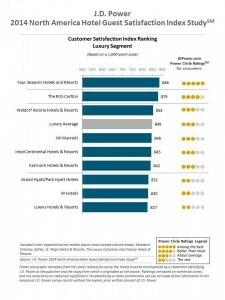 Overall satisfaction in 2014 averages 784 points on a 1000-point scale, up 27 points from 2012, with significant improvement in all segments except upper extended stay and extended stay, where satisfaction remains stable. The midscale segment posts the largest year-over-year improvement, increasing by 10 points to 801, which is the first time satisfaction in the segment has surpassed 800 points.